We are very excited to announce that after great demand we have launched our Affiliate Program. By signing up for our Affiliate Program, you can recommend AlphaDog Hosting to your friends, family, clients or anyone via your blog, social media posts, emails or ads and get paid. It’s really that simple. Our program is FREE to join. You get $5 deposited in to your affiliate account just for signing up. You can get a recurring commission up to 25%. That means as long as your referral is our customer…you get paid! You get a custom affiliate link. We track the visitors you refer to us using cookies, so users you refer don’t have to purchase instantly for you to receive your commission. Full program details available on our Affiliates Program page. 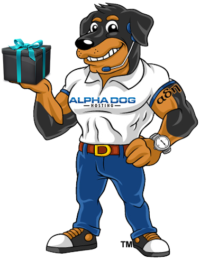 Register as a AlphaDog Hosting Affiliate. Select your banner and get the HTML code. Place the banner code or send your Affiliate link and start earning. So what are you waiting for? Activate your Affiliate account and start earning money today!